I am a huge believer in making the most out of what you have got. I love to cook and try to bring my resourceful nature through into my food. Every week we get a fruit box from one of the many food box schemes which seem to be growing ever the more popular. We only get fruit as it is the only thing that we can't buy a huge variety of from our food market here in blackheath. Anyway we always get bananas every week, and I love bananas, but sometimes it gets a bit too much so by the next weeks delivery we have two or three browning very ripe bananas in our fruit bowl. So I decided to look up on the good ole internet a recipe to use them up. I added a few of my own little touches too as I am a sucker for spices. It was so delicious that I thought I would share it with you. Eat it still warm with a big cup of tea, it will store in a tin or container for up to a week as it is very moist. Firstly grease a loaf tin, I add a small piece of baking parchment into the bottom so that it wont stick and pre heat the oven at gas mark 4. You will need 2 bowls, in one roughly mash the banana with a fork and add in the honey and spices. In the other bowl cream together the marg/butter and sugar until smooth and pale, then add in the eggs and beat until combined. 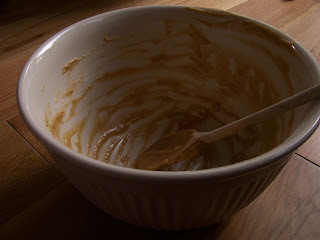 Then mix the banana mixture into the other bowl and mix until combined, it may curdle a little but dont worry. The sift the flour and fold into the rest until completely combined. Pour into the loaf tin and bake in pre heated oven for 40 mins then reduce the heat to gas mark 2 for a further 25-30min depending on your oven. If you are like me, and cant wait for something sweet, you can lick the bowl of cake mixture while you are waiting for the cake to cook. It should come out looking a bit like this. 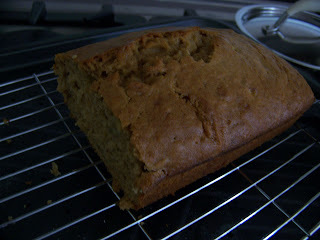 The ends are the best bit as they are a bit crunchy and then the cake inside is really moist. 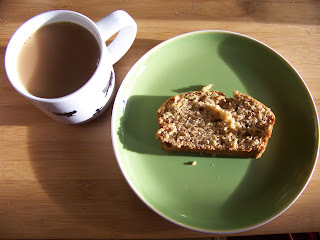 Please make this cake, honestly it is so delish I am actually hoping that we dont finish all our bananas again this week so I can make another one. Remember it for when you do. I was naughty and made another one today with added chopped up bits of dark chocolate. I havent eaten it yet but it smells amazing. I am about to make this at last Laura!